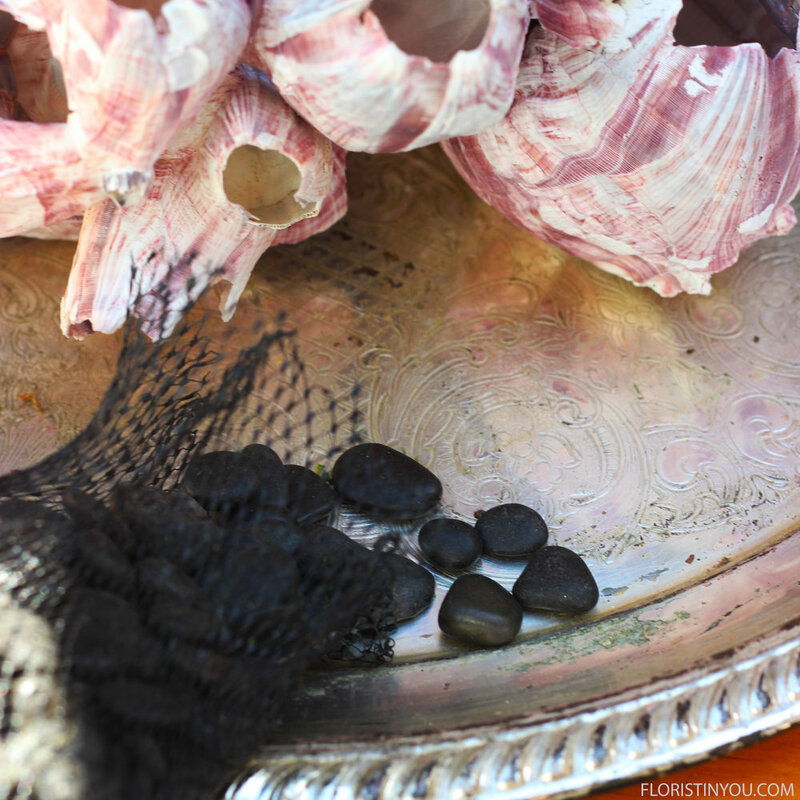 This arrangement combines treasures from the sea, i.e. 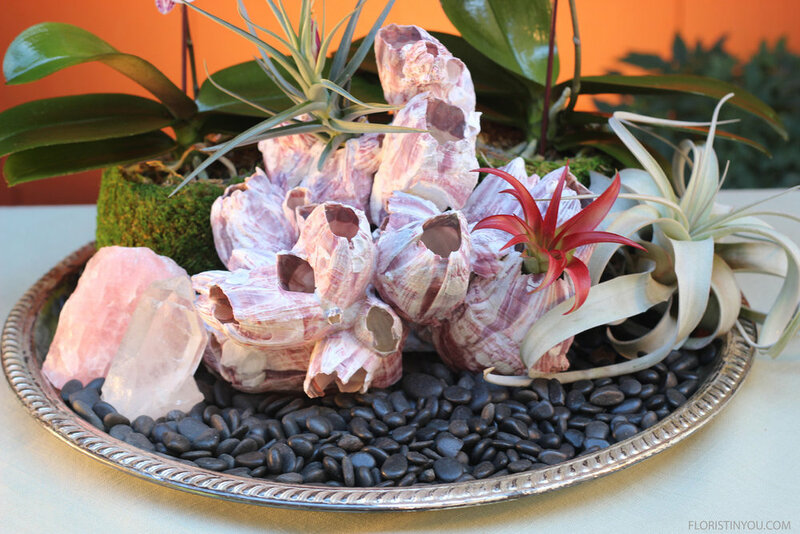 purple barnacles, mini orchids, xerographica (the large airplant with leaves that curl and look like a bun in someone's hair) with other airplants, and gemstones which are semi-precious. The arraignment will last for a good while, and when the last blooms of the orchids have dropped off, you can keep the grass cups you have made and you can slide new orchids in. The airplants, with proper care, will last a long time, and they are not hard to care for, just don't get the roots wet (as that would rot them). Care tip: Give orchids 2 ice cubes a week and let the ice cubes melt. 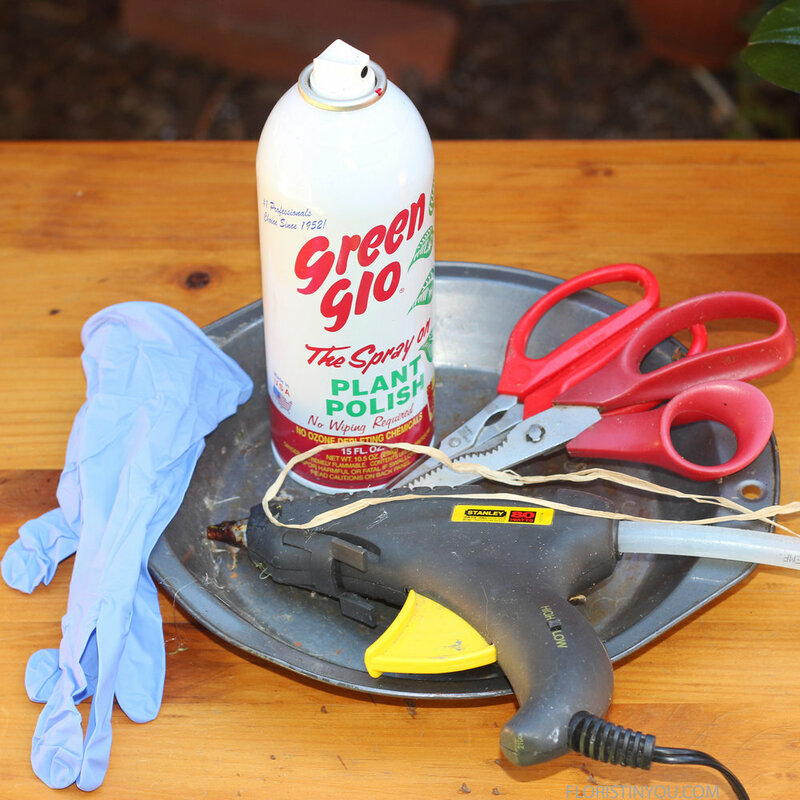 Care tip: Spray airplants with water 1-3 times a week. Keep in indirect sunlight. If you have your orchids, airplants, barnacles and supplies, let's begin. It's not hard, promise. This is what you will make the arrangement with. You will also use these. Slip sheet moss out of bag and cut in half lengthwise. Trim strip to 3.25 inches height. With sharp pruning shears trim off fattest part on back side. Spray leaves only of orchids with Green Glow. 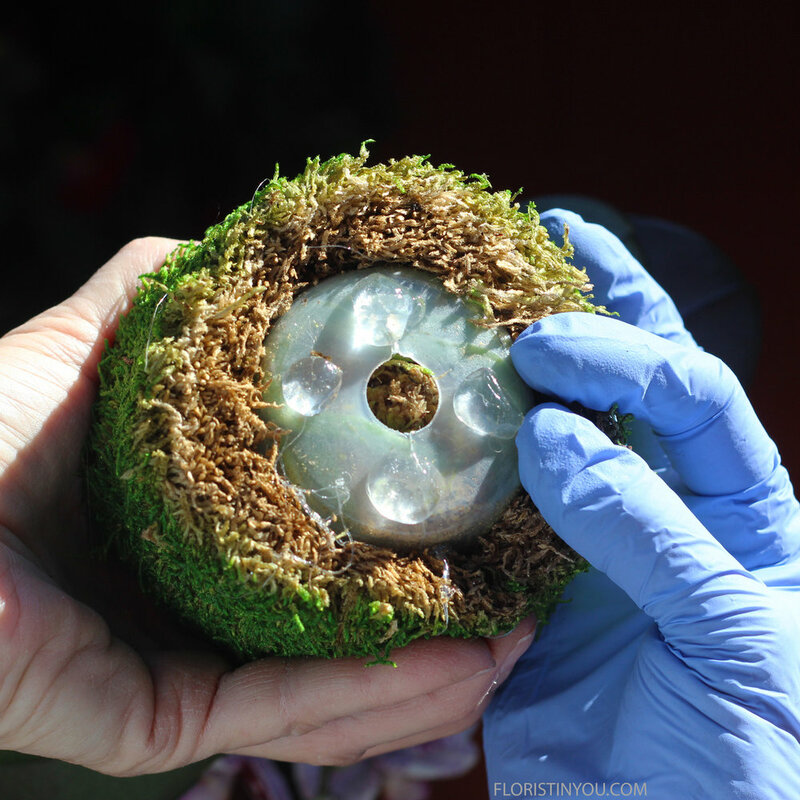 Put hot glue on top, bottom sides of moss. Press to orchid cup and press sides together until it dries. Make little balls a little fatter than peas with Quakehold! Gel. Push 4 balls of gel onto bottom of orchid cups. Put both orchid cups on tray. Push orchid cup down on tray and hold for 30 seconds. 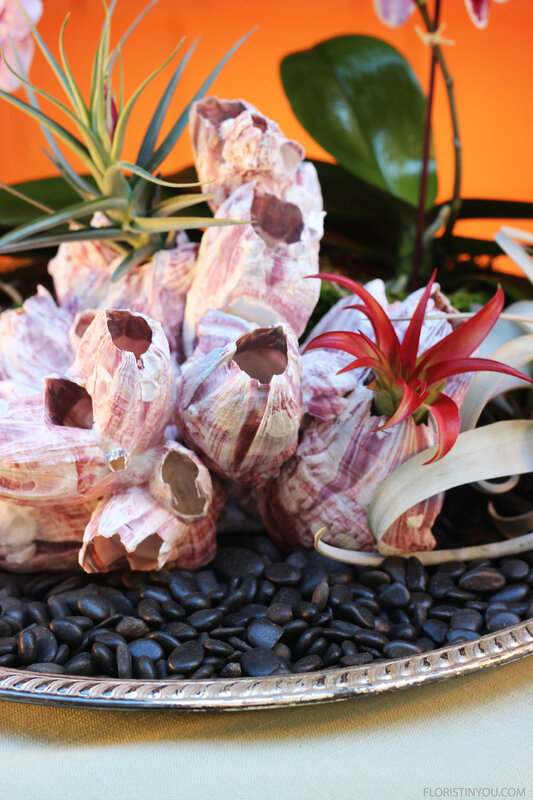 Place barnacle in front of orchids. Put black pebbles around these on the tray. Put gel balls on bottom of rose quarts. Push into tray. Hold 30 seconds. Put gel balls on bottom on quartz. Push into tray. Hold 30 seconds. Rock go on left side of barnacle. This one if flowering and will soon have pups. Place xerographica to right of barnacles. It looks like a scene from under the ocean. Enjoy this orchid and airplant garden.